Want to stretch it out while taking in London’s beautiful skyline? Then get yourself along to one of these rooftop yoga classes. From the Shard and Sky Garden to Peckham’s Bussey Building, we’ve found the best places to perfect your yoga poses up in the sky. Yoga in London doesn’t get more exhilarating than this! 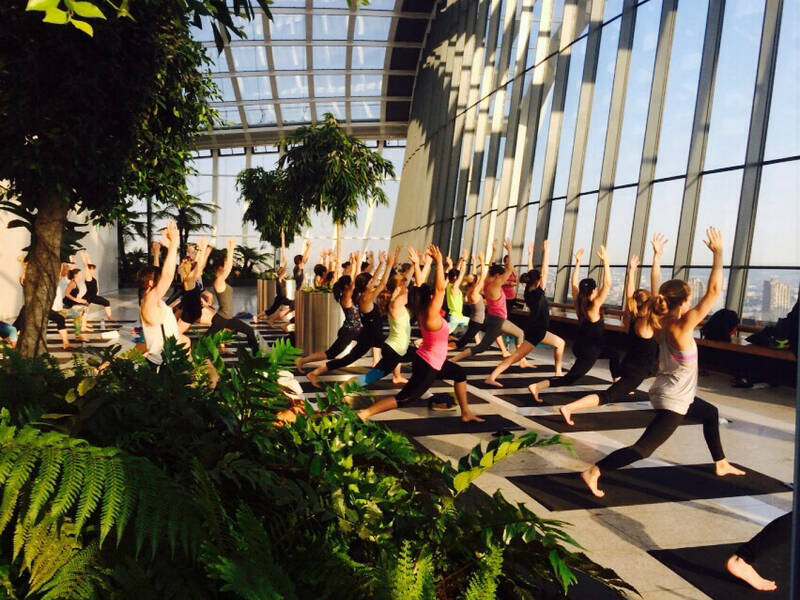 The Sky Garden at the top of the Walkie Talkie is a wonderfully serene spot to do some yoga – it's light, spacious and packed with foliage. The classes here follow a dynamic vinyasa flow style so expect to break a gentle sweat. During the week they take place at 6.30am which means you get to watch the city wake up as you practice your sun salutations. There are also weekend classes which begin at 8am (8.30am on Sundays), and you could make a morning of it and head to the Darwin Brasserie afterwards for brunch. If you want to take your yoga up a notch (literally), sun salutations at the peak of the O2 are now a thing. The famous London venue usually hosts world-class musicians and events, but this time, a visit will have you bossing an uphill climb (which is 52 metres high and takes 90 minutes, by the way) and then stretching your way through a 50-minute yoga class lead by instructor Craig Norris. 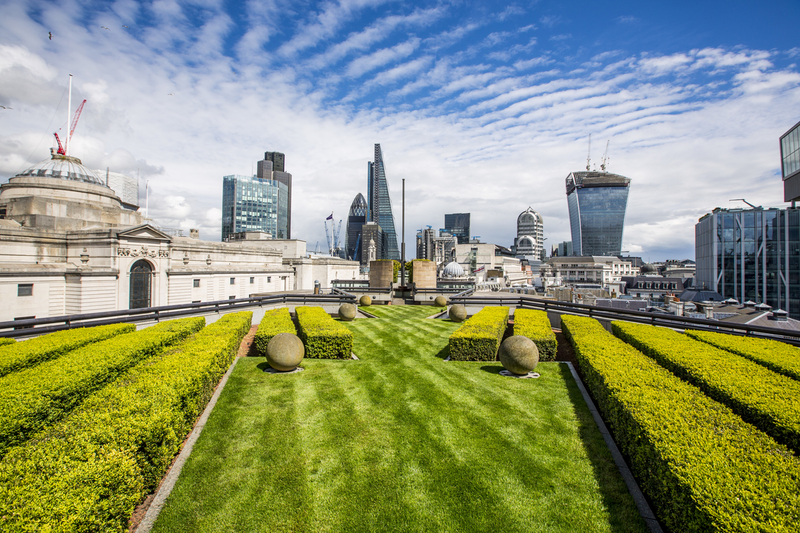 For more info on how to find your Zen amongst the London skyline, click here. 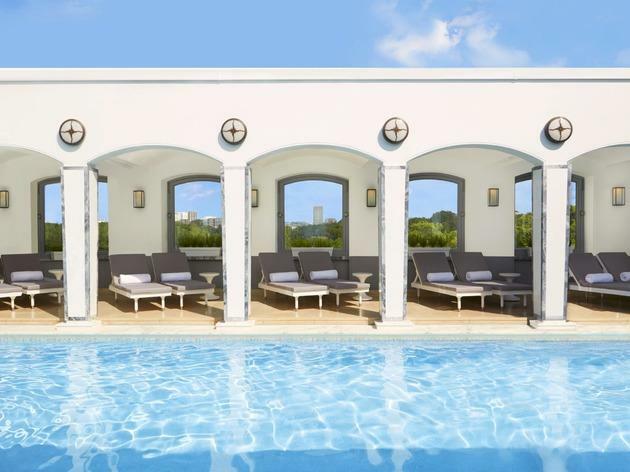 Forget staring into an old mirror at your gym, the Summer rooftop yoga at Madison will have you gazing across London’s most iconic landmarks as the sun rises. Sure, the city isn’t normally the most tranquil setting, but the morning classes at Madison just about beat rush hour so you shouldn’t have to put up with too many lairy commuters while you’re doing full-wheel. 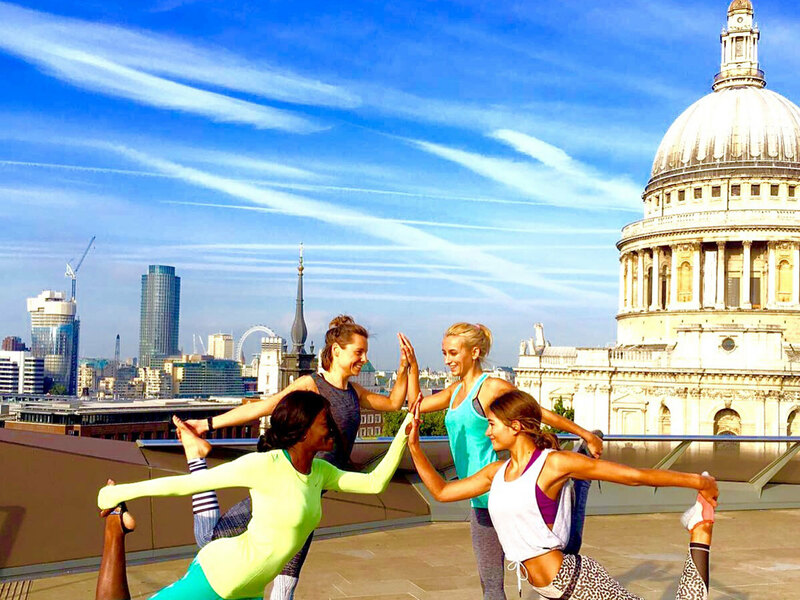 With views of the picturesque St Paul’s Cathedral, make the best of this rooftop yoga while it lasts - come August it’ll be gone. Find out more here. Exercise highs don't come much better than this: yoga at the very top of the Shard, London's tallest building. 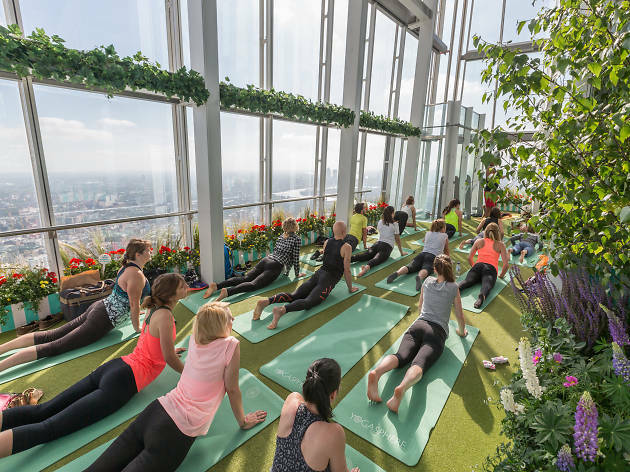 Yogasphere host classes each Saturday, and if the weather's good they take place on the viewing platform at the glass tip of the building – partially open to the elements (vertigo sufferers, brace yourself!). Classes aren't cheap, but they do include a viewing session before and after the class. Plus the company plants an impressive 10 trees per person, per hour-long class it puts on. The 360-degree views – which can sometimes stretch as far as 40 miles – really are something special. 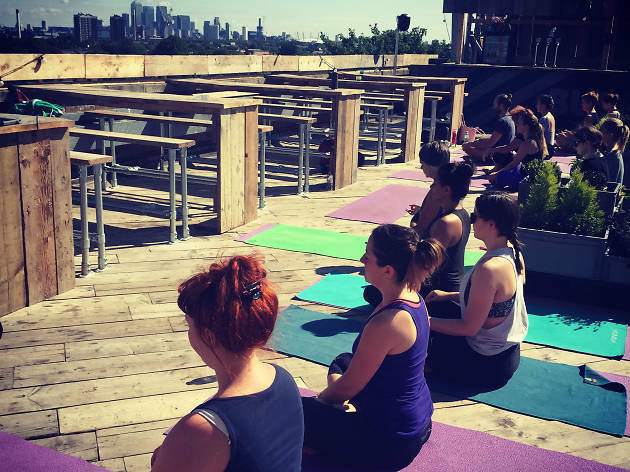 Yogarise is a yoga studio based in Peckham's much loved Bussey Building, set up by two locals keen to bring the yoga love to their patch of London. During the summer they take their classes alfresco, occupying Rooftop Film Club's upstairs space. Fans of Frank’s Cafe (that's everyone, right?) will already know the views from here are fabulous. There are two studio spaces, and classes run at various times throughout the week. The Fat Buddha Yoga team are all about switching up your morning yoga sesh. Their Rise’n’Shine class takes place between 7:30 and 8:30am on the roof of fancy French eatery Coq D’Argent where you’ll have spectacular views of the City coming to life. Because it’s an open level class, anyone can go with the flow, from rookies to expert yogis. Plus - it’s only a tenner when booked in advance. 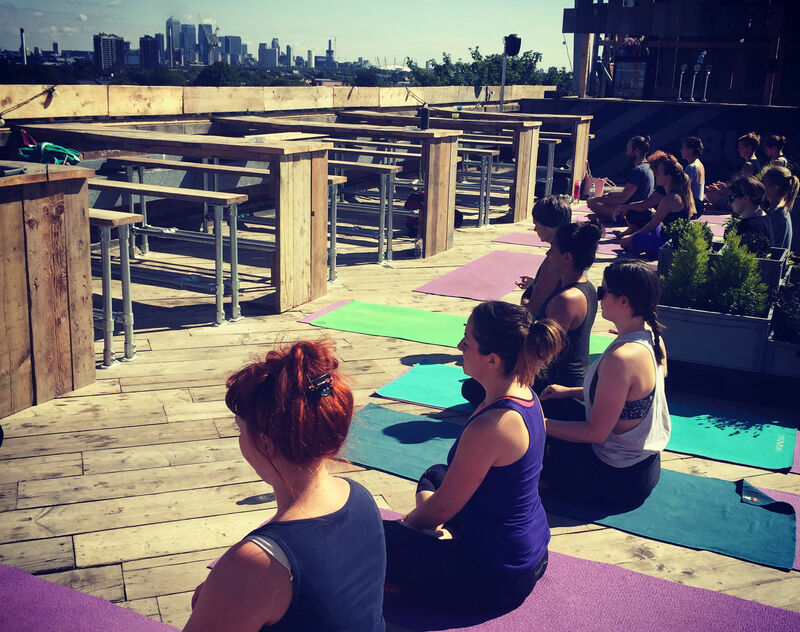 Stratford’s Roof East is a sweet spot to do some yoga in the sunshine. Their flow class is BYOM (bring your own mat) and is all about finding zen in the open air. Exactly what's needed after a long day slogging in your air-conditioned office. Once you’ve sweated out your stresses, you can hang around on the rooftop for a kombucha cooler in the sun, or bag a deck chair and get ready for some sweet popcorn action with Backyard Cinema. Balance, bend and stretch out in downward dog at Sunset Flow yoga, another class from the guys at Fat Buddha. 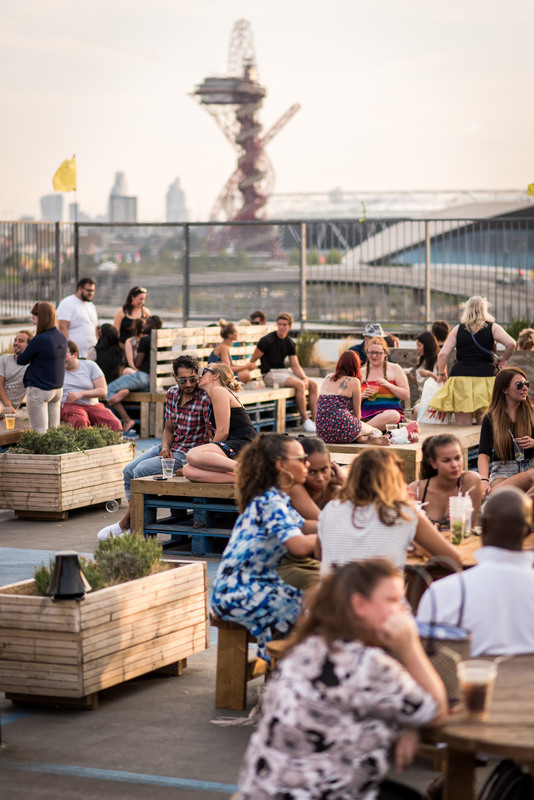 This time, wind down after the working week on the roof of the Old Truman Brewery. 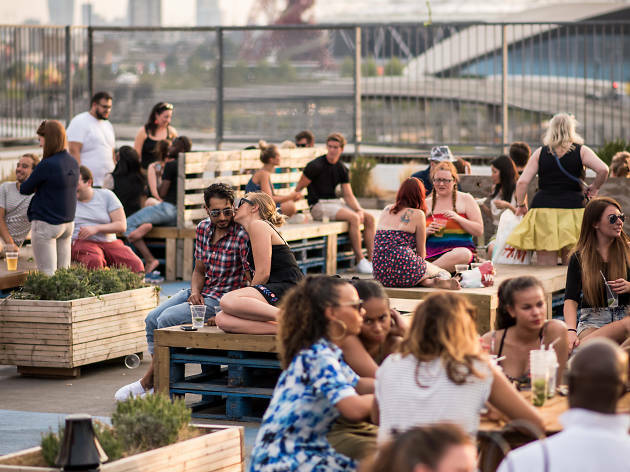 Once you’re down, have an explore: this east London hotspot is also home to markets, pop-ups and events like ‘Vegan Nights’ (where you’ll end up eating yourself to oblivion if you’re not careful). Ain't no mountain pose high enough to keep you from getting to class, because there's no need to book (but it’s cheaper if you do). Want to sweat in style? 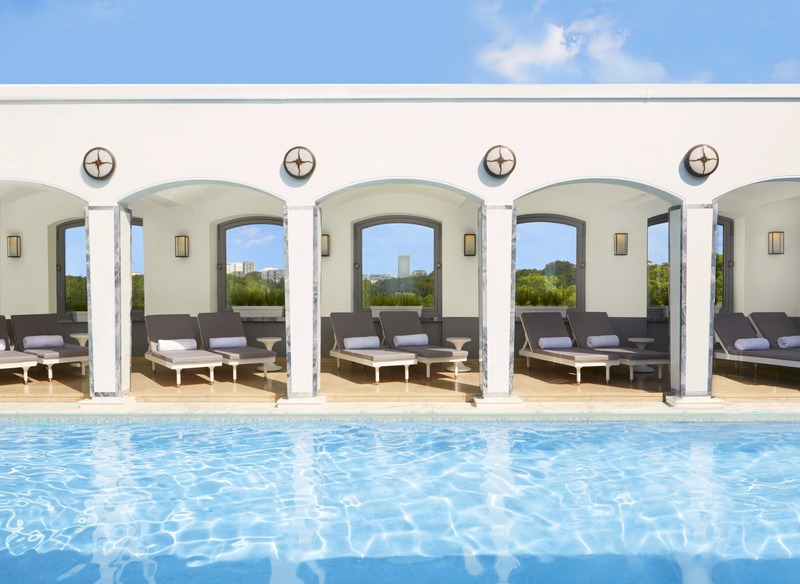 Making fitness fancy, The Berkeley has teamed up with athleisure brand Silou London to create rooftop yoga sessions. If you fancy dropping into a class here, head up to the incredibly opulent spa and their (shhh) secret garden, where you'll be rewarded with views of elegant West London. Just don’t let the skyline distract you from your sun salutations, okay? Sandwiched between Moorgate and Liverpool St station, the late night Aviary bar usually dishes up fancy foods and cocktails. Come Summer, though, the impressive rooftop makes a pretty fab spot to get stretchy. 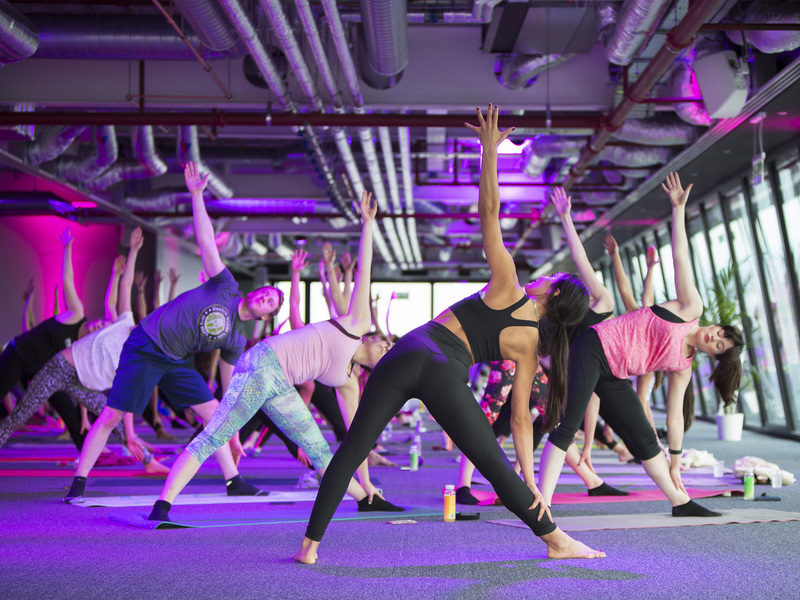 This June they're holding 45-minute vinyasa sessions in collab with Triyoga, so expect panoramic views (including fan faves The Gherkin & Walkie-Talkie building) and dynamic classes guaranteed to make you sweat. Find out more here. 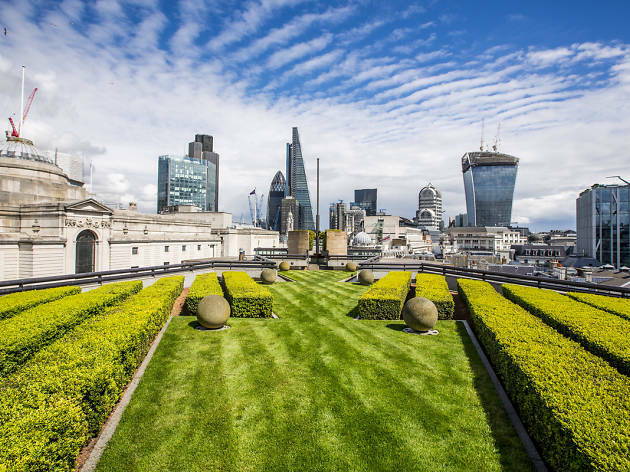 As you reach for the sky on the 11th floor of the Park Plaza hotel, take a good look around you - because you'll get to see some of the city's most famous landmarks from one of the best spots in London. The best news? It's free. You can partake in summer salutations on the South Bank on either 11th August or 1st September (or both) - but be quick to book, because there's a limited number of spaces available. Get seriously sweaty in these classes at the city’s best hot yoga and bikram spots.